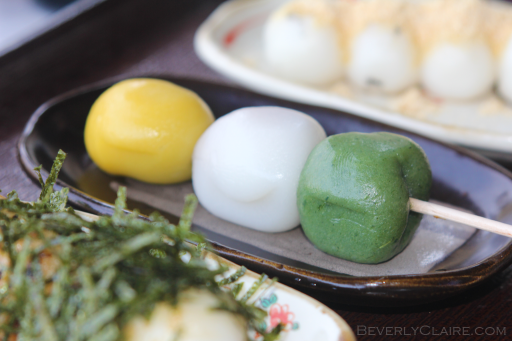 だんご “Dango” are dumplings, usually served in threes on a stick. The one in the middle is called 三色だんご or tricolor dango, and has sweet bean paste inside. In the foreground is 醤油だんご dango with soy sauce and dried laver seaweed. The one in the background is a simple きなこだんご dango with ground soybean. These were bought (and eaten!) at Sankeien Garden in Yokohama. You just finished reading Dumplings-on-a-Stick. Please consider leaving a comment! This post is from the 3D viz and photography website, Beverly Claire Designs. If you are not currently reading this via designs.beverlyclaire.com, then this post may have been stolen or scraped from the Beverly Claire Designs site. Republishing this article in full or in part is a violation of Copyright Law (c)2010-2014, All rights reserved. The one with sweet bean paste is the most familiar to me (we have similar ones in the Philippines). I don’t know how I’d like the savory ones but the stick certainly looks appetizing.